I first heard The Redskins’ ‘Bring It Down (This Insane Thing)’ circa 1985 on ‘The Max Headroom Show’, but, beyond clocking Alexei Sayle’s performance in the video, I didn’t know what to make of it at the time. It didn’t help that Max was speaking in tongues all over it. Listening back to the song recently, I was seriously impressed. There are shades of early ’80s punk/funk: Gang Of Four, 23 Skidoo, A Certain Ratio, plus a bit of Dexys/Jo Boxers, and there’s also a superb horn arrangement in a great (or not-so-great, depending on your predilection for horn sections) period for horn sections. The band are a solid, funky little unit and I like singer Chris Dean’s chuckling Melle Mel homage and general swagger – it’s a classic ’80s vocal performance. Their Wikipedia entry says that The Style Council’s Steve White plays drums on this but it doesn’t particularly sound like him. 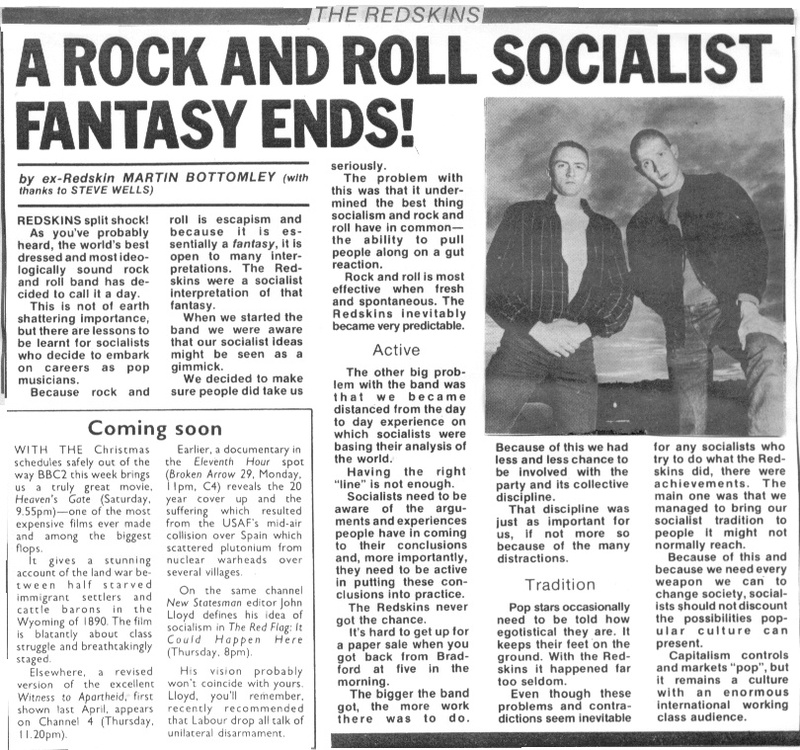 The Redskins burned fairly brightly for four years, starting out as an NME-approved indie act and then graduating to a major-label deal in the classic ’80s style. They split up after their Anti-Apartheid tour of 1986. ‘Bring It Down’ was their one and only UK top 40 single – a fairly poor return when such blue-eyed-soul inanities like The Blow Monkeys’ ‘It Doesn’t Have To Be This Way’ were just around the corner. Where are they now? Who knows? No reunion. No sell-out. One near-hit. In the world of black music, whether jazz, funk, R’n’B or soul, the hookup between the drummer and bass player has always been pivotal. As the cliché goes, a band is only as good as its engine room. In jazz, you can’t do much better than Tony Williams with Ron Carter or Philly Joe Jones with Paul Chambers. In funk, you can’t go wrong with Benny Benjamin with James Jamerson or Clyde Stubblefield with Bootsy. In fusion, you know it’s going to work if Dave Weckl/John Patitucci or Steve Jordan/Anthony Jackson are taking care of business. But interestingly, possibly the most heralded rhythm section in recent black music hasn’t come out of jazz, funk or soul music (though these undoubtedly went into the mix), but rather hip-hop. Drummer Keith Leblanc hooked up with bassist Doug Wimbish and guitarist Skip McDonald when they were summoned to work on the label set up by industry veterans Sylvia and Mickey Robinson to showcase the new hip-hop artists emerging from the Bronx and Brooklyn in the mid-’70s. Just prior to that, Keith had briefly worked with Doug and Skip in the funk band Wood, Brass and Steel but when The Sugar Hill Gang’s controversial ‘Rapper’s Delight’ became a monster hit in ’79, the Robinsons were on the lookout for a house band to lay down the foundations for the follow-up. They moved to the slightly more lugubrious surroundings of H&L Studios in Englewood Cliffs, New Jersey (also home to Rudy Van Gelder’s famous studio where so many classic Blue Note albums were recorded), and so began a golden period of recording characterised by great performances captured sometimes under great duress in the studio. Extended jams like Funky Four Plus One’s ‘That’s The Joint’, The Sequence’s ‘And You Know That’ and Grandmaster Flash and the Furious Five’s ‘Freedom’ featured jazzy horn charts, challenging stop-and-go arrangements and extended solo sections that had more in common with Duke Ellington or Cab Calloway than Eminem and Jay-Z. Featuring a mash-up of Leblanc’s apocalyptic beats and segments of Malcolm X’s oration, the track led to many more intriguing fusions of man and machine in his recorded output and also prefigured the Tackhead project which teamed up Leblanc, Wimbish and McDonald with London dub mixologist Adrian Sherwood to thrilling effect. Sadly, the Sugar Hill story wouldn’t be complete without reporting its demise – in less than honourable circumstances, according to Leblanc – with lots of law suits, claims and counter claims. 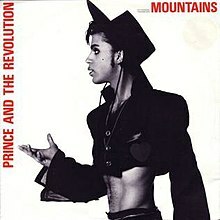 But much of the music stands the test of time, particularly the extended jams of the ’80/’81 period which suggested a thrilling fusion of Duke Ellington, George Clinton and Trouble Funk. Leblanc has continued to work with Doug Wimbish and Skip McDonald regularly over the years in projects such as Little Axe and Mark Stewart and the Maffia. Check out what he’s been up to on his Facebook page.